Every skincare regimen needs to start with the right face cleanser, and this simple step prepares the skin for the skincare products that follow. 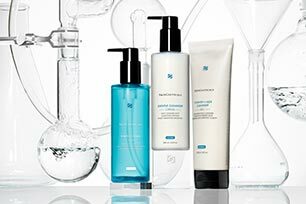 With a face wash for every skin type and condition, SkinCeuticals skincare cleanser options ensure skin is free of dirt, makeup, and debris for optimal skin health and appearance. Choosing the correct face cleanser for one’s skin type is essential, whether a creamy face wash for dry skin, a foaming skincare cleanser for acne or a gentle cleanser for sensitive skin.A face cleanser is an essential skincare product both morning and night, and is especially important for removing the dirt and makeup that accumulate on skin throughout the day. Thorough cleansing in the evening can help prevent clogged pores, acne, free radical damage, and other signs of accelerated skin aging.